We tend to treasure long summer days filled with sunlight and are reluctant for winter to come when we leave for and arrive home from work in the dark. It's hard to imagine a place where twenty-four hour darkness is a friend and the encroaching light is the intruder. 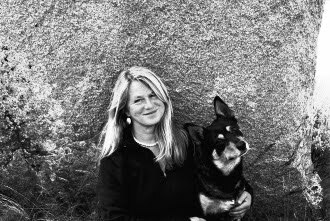 Gretel Ehrlich (This Cold Heaven: seven seasons in Greenland) is a travel writer and a poet who, in a desire to see the world above the treeline, travels to Greenland to follow the paths of Danish explorer Knud Ramussen and American artist Rockwell Kent. The three stories, interspersed with Greenlandic folklore, seem intertwined, making this a challenging read, but one well worth the effort. Greenland is at a fascinating point in its history. Traditional ways of living still exist in the face of encroaching technology. Subsistence hunters will use both dogsleds and email (though not at the same time!). Greenland is changing due to both climate and economics and Ehrlich captures this idea with a degree of sadness and regret. Only Greenland's rocky coast in habitable, with over eighty percent of the island covered in ice. Greenlandic people speak a mixture of Greenlandic and Danish, with English becoming a dominant language. Some families strive to speak Greenlandic at home so the language is not lost to their children. Rasmussen's and Kent's stories illustrate the harsh conditions endured even in the twentieth century. Interdependence was the key to survival. Greenlanders live communally with, in our experience, little or no personal privacy. In their world "solitude is thought to be a form of failure". Ehrlich, who is also a poet, writes a travel book that is not only filled with fascinating geographical and sociological details, but is also lyrical and dreamlike in its own right. Isabel Allende, while writing about a completely different part of the world, has a similar feel in My Invented Country: a nostalgic journey through Chile.